The finest map of London issued in 1823. Pigot and Co's New Plan of London, Taken from the best Authorities with the Geographical bearings from the Dome of St. Paul's And formed into Divisions by means of circular lines each division being referred to in their list of Streets and Public Buildings in the Metropolis, The whole forming the most complete guide to London and ITS VICINITY YET PUBLISHED. An attractive 1823 first edition example of James Pigot's map of London, England. Centered on the Thames River, Pigot's map covers from Islington to the East India Dock and from Camberwell to Kensington Gardens. The City of London is highlighted in red and the various parks in green. All streets, bridges, and important buildings are meticulously identified. Pigot's map was, as advertised, the best map of London available at the time. It was subsequently revised and reissued in two further editions, 1824 and 1831. The present example is, as stated, the first edition. James Pigot (fl. 1795 - 1843) was a London based map engraver and map publisher active in the late 19th and early 19th century. Stylistically Pigot's work resembles that of Cary, Thomson, and Pinkerton, though he was far less prolific. The first reference to Pigot is in a 1794 business directory of Manchester, England , where he is listed as an engraver. In 1804 he published a map for Dean's Manchester Directory. Dean must have inspired him for around 1811 he established his own directory, Pigot's Directory, which competed with the Dean Directory until about 1813 when the rivals seem to have merged. Pigot eventually moved to London where he established himself on Basing Lane. There in 1823 he published his first London Directory. Around 1830 his son joined him in the business and it was renamed Pigot & Sons - though the later seems to have little serious interest in the business. In 1939 Pigot partnered with his apprentice, Isaac Slater (1803 - 1883), renaming the firm Pigot & Slater and relocating to more prestigious offices at 59 Fleet Street, London ( though they maintained their offices at 18 Fountain Street, Manchester). Pigot died in 1843 though Slater and his son J. W. Slater continued to operate under the Pigot & Slater name until the firm was acquired by Kelly & Co. in 1892. Good. Backed with archival tissue. Some damage and verso repairs to original fold lines. Large tear extending from right side repaired on verso. Older verso repairs have levt mild discoloration. 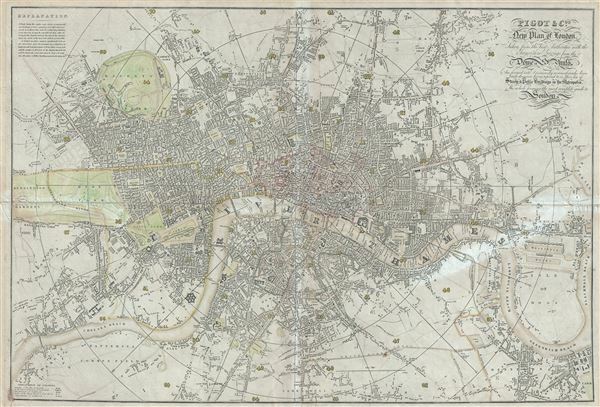 Howgego, James L., Printed Maps of London circa 1553-1850, 298 (1). OCLC 1062140312.